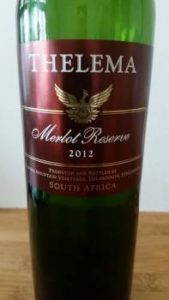 For their sins, the crew at Thelema have gained a reputation for being one of our leading practitioners of Merlot and the 2012 of the Reserve has just been released. How to suppress or mask any unfortunate “green” character must be the key challenge for any producer aspiring to make top-shelf Merlot and one obvious way of doing this is to pick at a higher level of ripeness – the Reserve 2012 has an alcohol by volume of 15%. It’s also been given the full monty in terms of oak – maturation lasting 18 months in 100% new barrels. On the nose, red currant and cherry plus a little spice. The wine is full yet not too plush – there’s a good line of acidity and the extraction is well judged. There remains some mint, as you might expect from this property, but at a level that is neither here nor there. All in all, about as an accomplished a rendition of single variety Merlot as you could hope for. Price: R265 a bottle. What a winemaking team Rudi Schultz and co is. Always up there.